The Stanley Cup Finals aren’t even over yet and already we’re hearing about which players are likely to be traded this offseason. There’s no shortage of rumors and plenty of speculation, with reports of numerous offers being fielded by many different teams for their players potentially available in a trade. Besides the potential availability of draft picks (like the Dallas Stars’ coveted 3rd overall pick), plenty of big names seem likely to be moved this offseason. After one of the first seasons in franchise history, the Avalanche are looking for a fresh start next season and are hoping to rebound from a dreadful 30th placed finish this year. However, they might not be icing a lineup with Duchene, as Bob McKenzie has said is the player most likely to be traded this offseason. A former third-overall pick, Matt Duchene started his career strong but had a difficult season this year. Once scoring 70 points in only 71 games in 2014, Duchene saw his point totals dip all the way to 41 this year, in part because of the Avalanche’s struggles as a whole. There’s no doubt he’s still a talented player but both Duchene and Colorado could use a fresh start. The Avalanche should have no trouble finding potential partners as Duchene brings a lot to the table. At only 26 years old, Duchene still has a lot of good years left in him and, while unlikely he goes back to topping 70 points, he should do a lot better with a change of scenery. He started the year with 22 points in his first 26 games and it was only last season where he scored 30 goals and notched 59 points in 76 games. Besides Duchene, there’s another pretty big name available from Colorado. 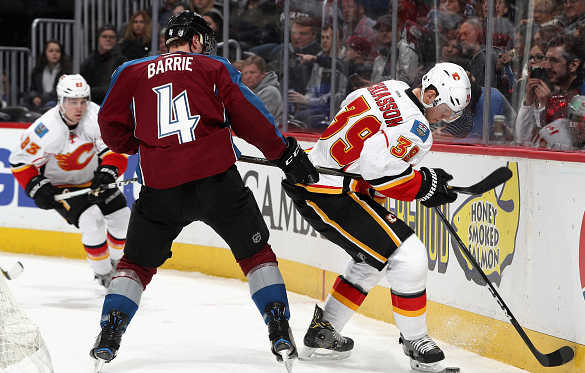 With rumors about Tyson Barrie being available, teams in need of a talented, offensive-defenseman can look to the Avalanche. Similar to Duchene, Barrie is still young at 25 years old and can instantly boost a team’s top-four. Logging an average of 23 minutes per game over the past two seasons, Barrie’s known as a premier offensive defenseman in the NHL. Two seasons ago Barrie put up his first 50-point campaign and followed that up last year with 49 points through 78 games. Even though Barrie only scored 38 points this season, most players had down years on Colorado and there’s no reason to believe Barrie won’t bounce back next season. This was the first time since his rookie season where Barrie didn’t score over 10 goals and that was mostly due to bad luck. Even though he took the most shots this season in his career, his shooting percentage was less than half of what it had been over the three previous seasons. Barrie’s almost a lock for 40+ points in a healthy season and any team looking for more skill on the blueline would be lucky to have him. Finally, a player not from the Avalanche, it looks like the Edmonton Oilers are seriously looking into moving Jordan Eberle this offseason. A former first round pick from all the way back in the 2008 draft, Eberle has been one of the Oilers’ top forwards over the past few years. Topping 60 points three times in his career, Eberle has consistently been one of Edmonton’s most skilled scorers. However, with McDavid and Draisaitl needing new deals soon and the Oilers still wanting to upgrade their defense, it looks like Eberle might be the odd man out. And despite the bit of a down year this season (20 goals and 31 assists), the Oilers should have no problem finding a trading partner. A career 13.4% shooter, this was the first season where Eberle saw his shooting percentage fall below 10%, explaining the small decline in goals. Also not helping was Eberle’s decreased role, as he saw the lowest average ice time per game of his career. Eberele is still a very talented winger and can easily regain his 65+ point form on a new team with a slightly larger role than the one he’s been given in Edmonton.